Updated Tuesday August 22, 2017 by Saskatoon Minor Basketball. If you are in Grade 9 or older and have always wanted to be a referee/official please register with us between August 1st and September 3rd. 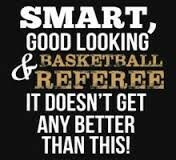 We will offer at least two referee/officials clinics to get you started and will have supervisors at every game to help you out. If you are a past referee/supervisor and are willing to come back on board please get registered as well. On August 1st the link to register will be underneath menu on the left hand side of the screen. It says Official registration and has a check mark on the red rectangle. It will be a great season and we cannot wait to have you on board!